Nature was on grand display on Washington's San Juan Island this month — and photographer Kevin Ebi was there to document it. He describes the scene as a 'dramatic act of thievery' when a bald eagle tried stealing a rabbit from a young red fox at San Juan Island National Historical Park. This battle went airborne - more than 20 feet at times - and the tussle was photographed from start to finish. Ebi says the red fox isn't native to San Juan Island, but introduced by settlers in the 1900s. He also notes that rabbits aren't the main prey of the fox, which typically prefer berries, insects and voles. 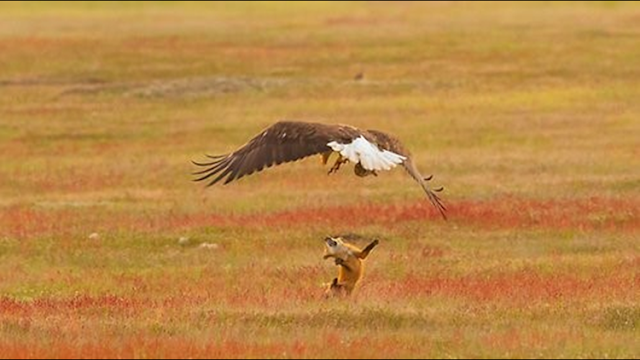 But on this day, a young fox and rabbit found themselves on the sharp talon-end of a hunting eagle. 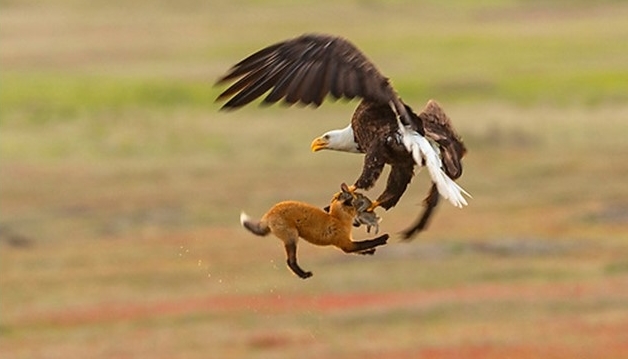 The scene began when the fox snatched a rabbit in a meadow and that's when Ebi noticed an eagle closing in on the rabbit. He writes, "To my surprise, the scene was even more dramatic than I expected. I thought the fox would drop the rabbit, giving the eagle an easy dinner." But the eagle had both animals in its clutches and the three animals took flight in a continuous struggle. Ebi says the kit put up a noble fight and the eagle let go with one talon, sending the fox falling back to Earth. Ebi says, "The whole battle was over in less than 8 seconds." 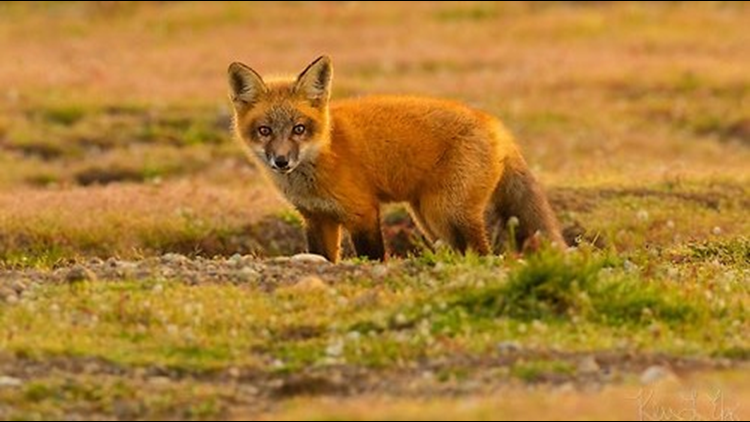 The young fox scampered off and Ebi says his photos didn't show a single scratch. But the amazing encounter doesn't end there. After KING 5 shared Ebi's photos, viewer Zachary Hartje posted video footage of the exact scene. Responses to "Epic battle between eagle, fox and rabbit on San Juan Island"
Did the eagle get the rabbit?